Throughout this century, North American Baptist peacemakers have given voice to their objections to war and to their conviction that the God of love wills peace. They have been courageous and prophetic. At times like a lightening rod, they have attracted the disdain of the majority of Baptist adherents. 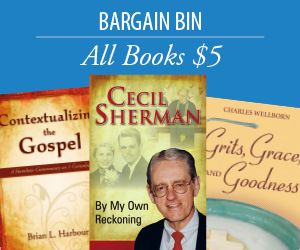 This book is offered in part to Baptist peacemakers who need to unearth the tradition in which they move. It is a glorious tradition that reaches back to biblical times, to the remnant communities of the Hebrew prophets and the primitive New Testament communities who held all things in common, who ensured that there was not a needy person among them, and who, with great power, gave their testimony that Jesus had defeated the powers of this world (Acts 2,4). 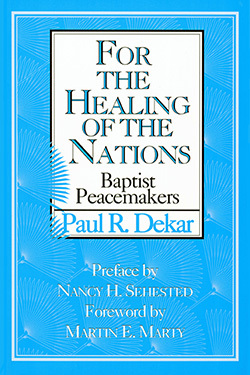 Paul R. Dekar is Professor of Evangelism and Missions at Memphis Theological Seminary. A graduate of the University of California(Berkeley), Colgate Rochester Divinity School, and the University of Chicago, he has also taught at Central Michigan University, McMaster University, Acadia University, and Whitley College of the University of Melbourne.